SCIENTIFIC NAME: Order Heteroptera, family Rhopalidae, Boisea spp. 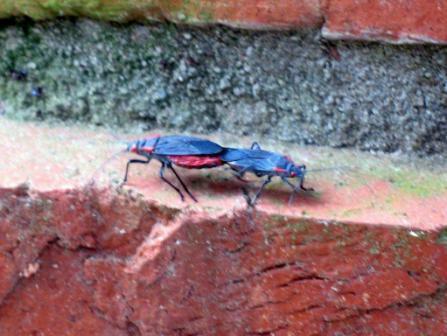 IDENTIFICATION: True bugs with grayish brown to black coloring and red highlighting. BIOLOGY AND LIFECYCLE: Eggs are laid in cracks of bark and on leaves. Nymphs are bright red. Adult females hibernate in protected spots and produce two or more generations. HABITAT: Building structures, boxelder and ash trees. Will enter structures especially in the fall. FEEDING HABITS: Feed mainly on the seeds of female boxelder trees. They will also eat foliage and flowers of ornamental plants and orchard crops. Injury is usually minimal. ECONOMIC IMPORTANCE: Little if any. NATURAL CONTROL: Birds and lizards. ORGANIC CONTROL: Plant oil products will kill them, if it’s really necessary. 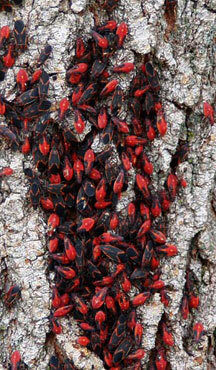 INSIGHT: Cut down the boxelder trees if you really don't want these bugs around. They may become a nuisance by congregating on trees, porches, and walls. They don't bite or harm anything around the house.